Test yourself with these 36 questions from the DVSA revision question bank on alertness including staying alert, avoiding distractions, mirrors, and recognising blind spots. The average score for this test is 88%. Can you beat that? The longer traffic lights have been on green, the greater the chance of them changing. Always allow for this on approach and be prepared to stop. It is illegal to use a hand-held mobile phone while driving, except in a genuine emergency. Even using hands-free kit can distract your attention. Park in a safe and convenient place before receiving or making a call or using text messaging. Then you will also be free to take notes or refer to papers. At junctions your view is often restricted by buildings, trees or parked cars. You need to be able to see in order to judge a safe gap. Edge forward slowly and keep looking all the time. Don’t cause other road users to change speed or direction as you emerge. Before emerging right onto a dual carriageway make sure that the central reserve is deep enough to protect your vehicle. If it’s not, you should treat it as one road and check that it’s clear in both directions before pulling out. Neglecting to do this could place part or all of your vehicle in the path of approaching traffic and cause a collision. You should be constantly scanning the road for clues about what is going to happen next. Check your mirrors regularly, particularly as soon as you spot a hazard. What is happening behind may affect your response to hazards ahead. Your attention should be on your driving at all times. Except in a genuine emergency never attempt to use a hand-held phone while on the move. It’s illegal and very dangerous. Your eyes could wander from the road and at 60 mph your vehicle will travel about 27 metres (89 feet) every second. Modern vehicles provide the driver with well-positioned mirrors which are essential to safe driving. However, they cannot see every angle of the scene behind and to the sides of the vehicle. This is why it is essential that you check over your shoulder, so that you are aware of any hazards not reflected in your mirrors. Look well ahead and only pull out if it is safe. You will need to use all of the road to pass the cyclist, so be extra-cautious. Look out for entrances to fields where tractors or other farm machinery could be waiting to pull out. If you have to make a U-turn, slow down and ensure that the road is clear in both directions. Make sure that the road is wide enough for you to carry out the manoeuvre safely. Ensure that you can see clearly through the windscreen of your vehicle. Stickers or hanging objects could affect your field of vision or draw your eyes away from the road. Windscreen pillars can block your view, particularly at junctions. Those road users most at risk of not being seen are cyclists, motorcyclists and pedestrians. Never rely on just a quick glance. Windscreen pillars can obstruct your view, particularly at bends and junctions. Look out for other road users, particularly cyclists and pedestrians, as they can be hard to see. It’s easy to lose your way in an unfamiliar area. If you need to check a map or ask for directions, first find a safe place to stop. While driving your concentration is required all the time. Even using a hands-free kit can still distract your attention from the road. Any distraction, however brief, is potentially dangerous and could cause you to lose control. Except in a genuine emergency, it is an offence to use a hand-held phone while driving. You should not allow yourself to be distracted when driving. You need to concentrate fully in order to be safe on the road. Loud music could mask other sounds, such as the audible warning of an emergency vehicle. Any distraction which causes you to take your hands off the steering wheel or your eyes off the road could be dangerous. Using a hands-free system doesn’t mean that you can safely drive and use a mobile phone. This type of mobile phone can still distract your attention from the road. As a driver, it is your responsibility to keep yourself and other road users safe at all times. Vehicle navigation systems can be useful when driving on unfamiliar routes. However they can also distract you and cause you to lose control if you look at or adjust them while driving. Pull up in a convenient and safe place before adjusting them. These lines are often found on the approach to a roundabout or a dangerous junction. They give you extra warning to adjust your speed. Look well ahead and do this in good time. As you drive, look well ahead and all around so that you’re ready for any hazards that might occur. There may be occasions when you have to stop in an emergency. React as soon as you can whilst keeping control of the vehicle. Windscreen pillars can completely block your view of pedestrians, motorcyclists and pedal cyclists. You should particularly watch out for these road users; don’t just rely on a quick glance. Where possible make eye contact with them so you can be sure they have seen you too. Except in a genuine emergency you MUST NOT use your mobile phone when driving. If you need to use it leave the motorway and find a safe place to stop. Even a hands-free phone can distract your attention. Use your voicemail to receive calls. Driving requires all of your attention, all of the time. If you’re following a large vehicle but are so close to it that you can’t see the exterior mirrors, the driver can’t see you. Keeping well back will also allow you to see the road ahead by looking past either side of the large vehicle. No phone call is important enough to risk endangering lives. It’s better to switch your phone off completely when driving. If you must be contactable plan your route to include breaks so you can catch up on messages in safety. Always choose a safe and convenient place to take a break, such as a lay-by or service area. As you begin to think about overtaking, ask yourself if it’s really necessary. If you can’t see well ahead stay back and wait for a safer place to pull out. Using a mobile phone distracts your attention away from driving. Distractions caused by mobile phones are known to be potentially dangerous. Avoid being distracted by your phone by turning it off before you start driving. It’s easy to be distracted. Planning your journey before you set off is important. A few sensible precautions are to tune your radio to stations in your area of travel, take planned breaks, and plan your route. Except for emergencies, it’s illegal to use a hand-held mobile phone while driving. Even using a hands-free kit can severely distract your attention. Plan your journey to include suitable rest stops. You should take all possible precautions against feeling sleepy while driving. Any lapse of concentration could have serious consequences. It’s illegal to use a hand-held mobile phone while driving, except in genuine emergencies. Even using hands-free kit is very likely to take your mind off your driving. If the use of a mobile causes you to drive in a careless or dangerous manner, you could be prosecuted for those offences. The penalties include an unlimited fine, disqualification and up to two years’ imprisonment. Before moving off you should use both the interior and exterior mirrors to check if the road is clear. 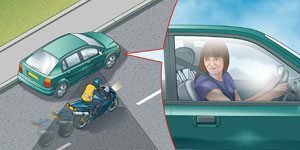 Look around to check the blind spots and give a signal if it’s necessary to warn other road users of your intentions. When driving on motorways, you can’t just pull up to answer your mobile phone. Do not stop on the hard shoulder or slip road. To avoid being distracted it’s safer to switch it off when driving. If you need to be contacted plan your journey to include breaks at service areas so you can pick up any messages when you stop. If you want to turn your car around try to find a place where you have good all-round vision. If this isn’t possible and you’re unable to see clearly, then get someone to guide you. Unlike someone in the car with you, the person on the other end of the line is unable to see the traffic situations you are dealing with. They will not stop speaking to you even if you are approaching a hazardous situation. You need to be concentrating on your driving all of the time, but especially so when dealing with a hazard. You should slow down and be cautious. The bridge is narrow and there may not be enough room for you to pass an oncoming vehicle at this point. There is also no footpath, so there may be pedestrians in the road. You should plan your overtaking to take into account any hazards ahead. In this picture the marking indicates that you are approaching a junction. You will not have time to overtake and move back into the left safely. The safest option is to switch off your mobile phone before you set off, and use a message service. Even hands-free systems are likely to distract your attention. Don’t endanger other road users. If you need to make a call, pull up in a safe place when you can, you may need to go some distance before you can find one. It’s illegal to use a hend-held moble or similar device when driving or riding, except in a genuine emergency. Before pulling up check the mirrors to see what is happening behind you. Also assess what is ahead and make sure you give the correct signal if it helps other road users. We'll email you a different test every day for two weeks to help you ace your theory test!